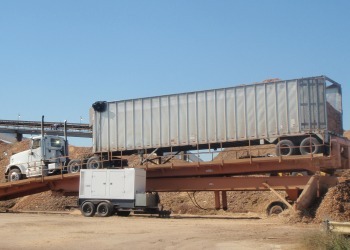 Our large fleet of equipment enables us to respond to the rigorous demands of our business. Mobile Forest Products & Biomass transports wood biomass and other material for the forest product industry in our area. With a fleet of over 70 trucks, 5 roll-off trucks, 150 trailers, and approximately 100 20- and 40- yard containers, we can quickly respond to the diverse demands of our business. Interested in a career as a commercial truck driver for MFP&B? Please visit our Career page.